Mr. Shannon was drafted in the US Army in 1942, during WWII. Bob was first sent to Fort Indiantown Gap for deployment and then to Camp (Wheeler), Georgia for 13 weeks of basic training. From there he went to Camp Patrick Henry Virginia to prepare to ship out to Europe with an infantry battalion. As would prove to be a fortuitous happening, when all the men had boarded the ship, Bob was still standing on the dock, waiting. They had not called his name to board the ship! Because the ship did not have proper papers on him, he was sent back to Camp Patrick Henry until things could be worked out. Since everyone had to work in the army at that time, Private Shannon was attached to another unit, still waiting at the Camp. One day while sweeping in an officers quarters, Bob overheard the man complain that his radio would not work properly, and he was quite upset. Bob offered to fix the radio, which he did in short order! The officer said he should be in the corps since he was so good with the radios and he would see what he could do to arrange it. There was a radio outfit on the base, and Bob was asked if he could read “Code “(Morse). He said yes, but had to take the test anyway. During the test, Bob got ahead of the tester, who said, “You are too good, you are on your own!” Private Shannon was told to report to the radio corps the next day! So Bob got new papers, which had made him a Corporal! The unit was soon sent to Casa Blanca in Northern Africa. The boat trip took 13 days to cross the Atlantic Ocean. There were 12 men in the outfit; they had 2 new cars to work with and 2 man teams. Their assignment was to locate enemy transmitting (radio) stations. Bob’s partner was Ben Attarti, from New York. 4 men would go out, 2 to a car, with DF antenna to monitor different frequencies and by using the DF antenna, they could pinpoint the location of the transmissions, which they would then report to the intelligence unit, who would then take out the transmitter and associated enemy. They located lots of them. Sometimes they would be in really small towns and would get locked inside the gates till morning! The unit was sent to Algiers and Bob was part of the CIC, Counter Intelligence Core. Their mission, locate transmitters. Again, they were to find them only, not try to dismantle the unit. That was the infantry job. But one time, they were very close to the transmitter, and Bob’s partner, Ben Attarti, went in by himself (against orders). Things did not turn out good for Ben that night. He was shot and killed. The things that Bob remembers best are the people he met while stationed overseas. There was a family that they met in Algiers. First the little girl child would come around the soldiers, looking for candy and other things the soldiers got in their rations each month. The child could speak English, which was a surprise to the men so far from home. Then the mother would show up and finally the man of the house. As the soldiers were to getting to know the family, they found out that they were the sole Ford Motor Company agency in the country, and rather well to do. The woman said that if the soldiers could get a chicken, she would cook it for them. So shortly thereafter, the men bought a rooster while on a mission and gave it to the woman. The family invited the group of soldiers, including Bob, to their home for a touch of civilization. The home was beautiful, with high guard walls and a gate! They had some of the best wine Bob has ever tasted. But the chicken!! Oh, the whole head was still attached! This small town guy was not so hungry after seeing that on a plate. Well, he did finally get some breast meat and it did taste really good! Later that year the company was Bofaurick, Africa, a tent city that held AFHQ monitoring service for the allies, 24/7, listening to everything on the radio, even Morris code. Again Bob’s savvy with radios brought him a promotion to T-4 Sergeant as a radio mechanic. From there he was sent to Rome Italy monitoring service, to decipher messages, which also had a room with a radio repair shop. 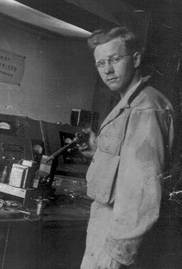 Again he got to work on the radios. From there he went to Milan which was a signal base. Every night there were air raids and they had to take cover. At this time, Bob came down with the flu and spent a few weeks in the hospital. His outfit was sent to Rome. Bob would sit in a local park while recuperating and watch the townspeople. He met a woman who asked him to read to her daughter in English, so she would learn to speak English. The woman, whose husband had been killed in the Italian army, lived with her mother, daughter and a servant. It was one of the best Sunday dinners he has ever had. It was there that Bob obtained a red and white motorcycle. He would try to ride around town but gas was a bit of a problem. Someone suggested he paint it OD (olive drab) like the military vehicles, and low and behold, he could get gas. Bob would ride the daughter of his friend around town. When the war ended, Bob was given permission to go back to the town, see his family friends and sell the motorcycle. When the company was sent home to Fort Monmoth New Jersey, they had a few weeks of R&R. The base was close enough that Bob was able to come home on weekends by borrowing his dad’s car! The unit was getting ready to ship out to Japan when the war ended. Everyone was happy that he did not have to go to war again. There was a big party at the American House Bar. After a few weeks at the Fort in New Jersey he was discharged back to real life. Bob had been married before he shipped out so when he came home they settled in Carlisle for about 1 year and then moved to Silver Spring Township where he lives in the same house today! Medals Bob earned were the African Campaign, Hershey Bars? Every six months, and the Good Conduct medal.Bob feels very fortunate that he did not get on the ship that day so long ago. The entire infantry company he was originally assigned to did not make it home. Bob and his wife have been involved with the Cub Scouts, Boy Scouts and raising a family in Central Pennsylvania. He says that at the time, everyone had to go to war. The whole world was involved and everyone was needed. Everyone had some kind of contribution to the war effort. He hopes it never has to happen again. 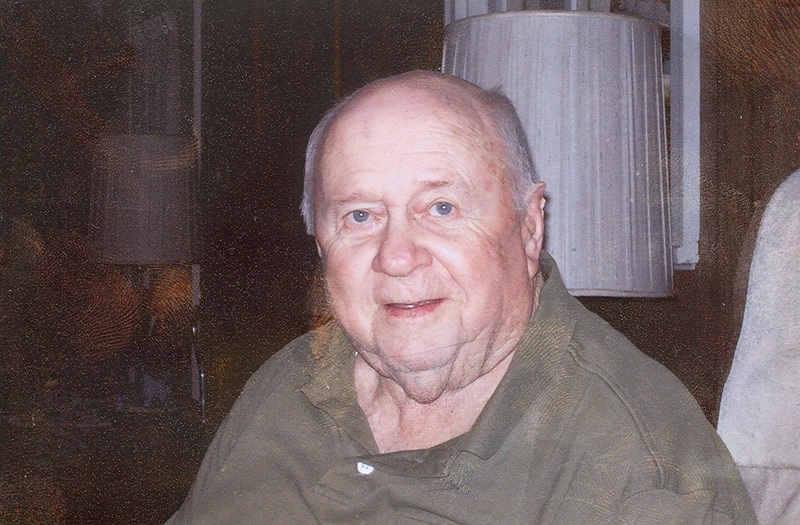 Mr. Shannon died on 17 February 2013.